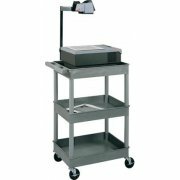 These Heavy Duty AV Utility Carts are durable enough to hold your heaviest AV equipment, including overhead and data projectors, televisions and computer monitors. Injection-molded thermoplastic shelves and legs provide an incredibly high weight capacity. Four heavy-duty casters and an ergonomic push handle facilitate easy steering, so you can get everything into place smoothly. 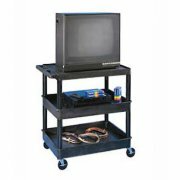 Multipurpose AV carts are convenient for any school, office, library or community center. When things need to be moved around quickly, anyone can easily roll them into position. Deep tub shelves keep equipment secure in place while you are on the move. 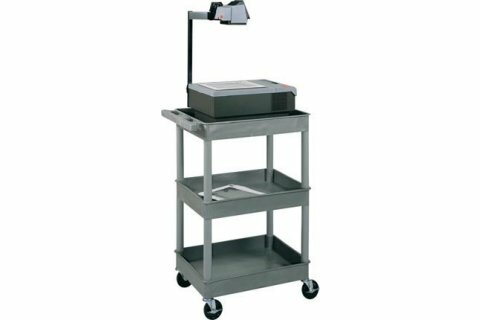 When you get where you need to go, locking casters ensure that equipment stays in position throughout the presentation, class or meeting. Versatile: Can be used for electronics, equipment, supplies and much more. Smooth Steering: Ergonomic handle molded into top shelf facilitates easy steering. Durable Material: Shelves and legs are constructed with an injection molded thermoplastic resin which will not stain, scratch, dent or rust. 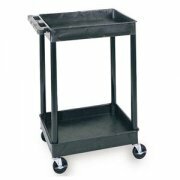 Stable Positioning: 2¾"-deep tub shelves keep things in place while the cart is in motion. Easy Rolling: Four 4" heavy-duty casters (two locking) roll right into position. Super Strong: Maximum weight capacity of 400 lbs. (evenly distributed).